Our flagship mobile living space, designed for full-time use with extended off-grid capabilities. Experience the freedom of mobile living for the modern world. Our flagship mobile living space, designed for extended off-grid adventure. Experience the freedom of intentional living. The Live Series is a true four-season unit. Rated down to below Zero Degrees Fahrenheit the unit comes standard with a conditioned utility basement, extensive insulation & thermal break, all dual-pane windows and extensive heating power. Heavy duty aluminum chassis and stainless steel reinforced trim make protect the unit from rocks and debris when travelling on rough roads. For traversing steep and uneven terrain, a rear beavertail pitches provides an increased departure angle and higher ground clearance. The Live Series comes standard with a 1400 watt rooftop solar system that trickle charges a 600 a/h AGM Battery Bank. A robust 3000W Pure Sine Wave Hybrid Inverter powers most 110V appliances wherever you are. With a 100 gallon freshwater tank, 62 gallon greywater tank and a 45 gallon blackwater tank, you can live normally even when off-grid. Enjoy a fluid connection to the outdoors. Oversized windows, skylights, and an 8' sliding glass door allow you to experience the empowering beauty of nature inside the comfort of your home. Extended off-grid living is made possible with oversized storage compartments, both inside and out, for all of your adventure equipment, food, clothing and necessities. With a carrying capacity to match, taking the things that matter with you is not only possible, but expected. Adjust the dining table and rearrange the cushions of the lounge to create a comfortable Queen-sized bed in the living area. As an optional upgrade, a Euroloft bed increases sleeping capacity to six with an extra long full-sized bed that automatically lowers from the ceiling. Enjoy a fixed Queen-sized bed in the master bedroom suite for a designated private sleeping area. Extend your cooking area to the outdoors with the modular island and included propane BBQ. For a luxurious bathing experience with a spacious feel, the spa-style bathroom is your private home sanctuary to relax and unwind. Locally-sourced Black Locust wood lines the shower, a heated towel bar provides radiant warmth, and a large skylight lets in sunshine while you wash. Prepare home cooked meals for friends and family with the spacious chef's kitchen. Complete with a three burner propane stove, a convection microwave oven and a six-drawer full-height pantry. Enjoy a luxurious mobile living experience with all the comforts of home. The Live Series combines beautiful aesthetics with the functionality of a modern home. 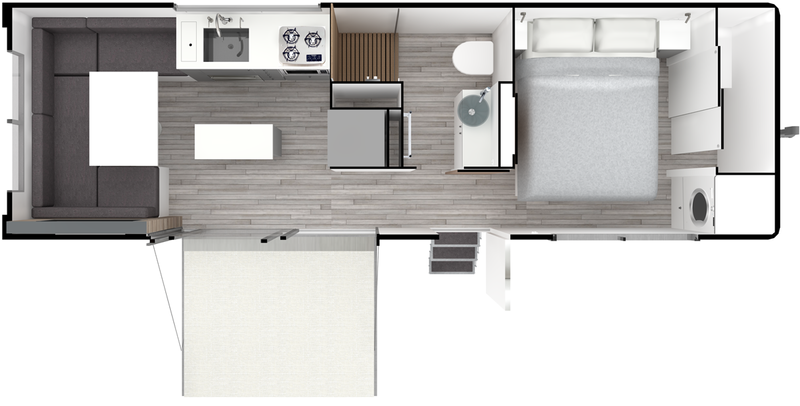 Designed to support full-time living without sacrificing the comforts of home. The Live Series combines beautiful aesthetics with the functionality of a traditional house. Enjoy a luxurious mobile living experience that is truly sustainable. Experience the freedom of extended off-grid living. The Live Series provides unprecedented performance without dependence on external energy resources, allowing you to live normally wherever you are. Thoughtfully designed spaces that can be easily adapted to fit your lifestyle needs. Go where you want and do what you want. The “Live Series” is engineered to withstand the demands of even the most extreme outdoor adventures. Four-season capabilities, off-road running gear, and storage for all your toys make sure fun has no limits. Go where you want and do what you want. The Live Series is engineered to withstand the demands of even the most extreme outdoor adventures. Four-season capabilities, off-road running gear, and storage for all your toys make sure fun has no limits.